As we mark the beginning of a new era in wearable devices, the smartwatch rat race has well and truly begun. From early Kickstarter projects to visceral time pieces by leading tech powerhouses, it's an open fight with everyone trying to architect the perfect solution to a consumer demand which is near impossible to define or establish. 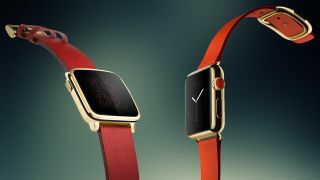 Some are building watches that serve as a digital companion to smartphones. Other smartwatch makers find that whole idea irritating and quite off-putting. Instead, they want a cool fashion accessory that's still modest in its pricing, tells the time (obviously) and has a built-in fitness tracker, with an option to tie in to third-party apps as well. Design, UI, battery life, class of apps, features, functionality and pricing are all factors to be heavily considered when purchasing the next wrist candy. With so many players in the field and everyone seemingly doing one or two things really well, we asked ourselves, what would make the ultimate smartwatch? In a fun experiment, we've taken a look at the current smartwatches on the market right now and picked the best features from each to see if we could create our own perfect smartwatch. Of course this device will never come to be, but a tech site can dream, right? From where we stand, a smartwatch should look like a watch. It needs to feel like one and behave like one. What we don't want is an overblown bulky plastic piece made with cheap material taking up precious wrist real estate (and making our friends turn away with an "I don't know this person" look). Fortunately, all the current smartwatches look the part and, depending on your specific tastes, there's one for just about every style/all tastes out there. But for our money, the Moto 360 is by far the most stylish and sleekest smartwatch on market right now. Its luxurious look and comfortable form factor is exactly what we feel a contemporary smartwatch should look like. Sporting a stainless shell, which comes in both silver and black, it boasts a stunning 1.65-inch circular display, weighing in just 1.7 ounces. While the disappointments centering around the poor battery life might be a deal breaker for many, the hardware team at Motorola have done an impressive job in crafting this elegant timepiece, which more than makes up for the lame battery life. It's been intriguing to see the journey smartwatch companies have taken to tell their story to the public. But there's a common theme running through most big-time smartwatches' narratives: fitness. Apple has focused much of its Apple Watch efforts on fitness and it stands head and shoulders above the competition in terms of what it offers for gym rats and fitness fanatics. Barring a GPS tracker, Apple has covered every corner within the health and fitness sector and its hard to see anyone bettering it. Android Wear and Pebble both offer third-party fitness apps such as Fitbit, Nike Fuel and Jawbone, plus many more. Fitness is an untapped market for consumers and a huge unique selling point for manufacturers. For years, major sports companies like Nike and Adidas have failed to capitalize in creating sport watches or sports bands without making much of a dent, despite numerous attempts, so it's good to see the first generation of smartwatches come with an impressive set of fitness features and apps. Notifications are an important feature to any smartwatch user, and controlling the amount you receive and monitoring them seamlessly are arguably the most important functions of a smartwatch. Users simply don't want to be interrupted every second with an insignificant notification, and we'd like to have the option to switch them on and off with minimum fuss. Android Wear and Pebble have done commendable jobs in providing notification settings on the watch which are easy to use and enable users to customize what they would like to receive. Notifications on the Apple Watch can only be controlled by your iPhone which could be an issue for consumers. Having to pull your phone out every time to disable Tweets can become tiresome. A feature that doesn't get much mention during smartphone discussions is music. To have the ability to pair Bluetooth headphones to your watch and play your favorite tracks is an underrated gem. With podcasts, radio and third party streaming apps such as Spotify all available as well, it means the experience is greatly enhanced. If this can be done without eating into the battery then even better. Combine that with any of the numerous fitness apps and you've got a pretty awesome work out audio kit. No need to lug your phone or MP3 player and no more tangled wires. This is where Apple really excels and provides great value. Smartwatches are expensive. Purchasing a case to prevent damage from wear and tear like you can for phones and tablets is possible, but who wants to wrap their sleek smartwatch in a bulk-adding case? Still, the last thing we want is to have to go back to the retailer asking for a replacement because of a cracked screen or broken strap (believe me, this will happen). What we want is something robust and durable that has the capacity to go the distance. Some watches might promote themselves as water resistant but very are genuinely water proof. The Pebble Time is one such wearable that you can actually go swimming with, while the Sony Smartwatch 3 is the most durable Android Wear device. So much so, that you are able to use it under water continuously for 30 minutes. If we had to choose though, we'd say the Sony Smartwatch 3 wins out with durability. You can't go wrong with the Pebble Time either, though, proving some smartwatches are getting the durability piece right.